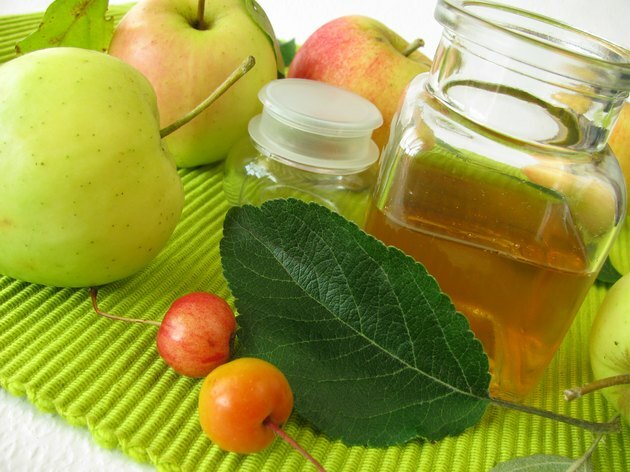 Apple cider vinegar is a type of vinegar that is produced from aged, crushed apples. The fruit sugar in the apple is converted into alcohol through a process called yeast fermentation. From there, the alcohol is then converted into acetic acid, which is the substance that is given the credit for providing all of the health benefits that are associated with apple cider vinegar. Always consult a physician before beginning any alternative treatment. Apple cider vinegar contains a plethora of vitamins and minerals, including magnesium, phosphorous, potassium, calcium, copper and iron, among others. There are claims of help with weight loss, acid reflux, high cholesterol and heartburn. Apple cider vinegar has also been given credit in aiding osteoporosis, cancer, memory and aging. Non-organic apple cider vinegar is vinegar that has undergone pasteurization. It is a bright color that is free from cloudiness, which is meant to be more visually appealing to the consumer. One of the main concerns surrounding non-organic apple cider vinegar is that the heating of the pasteurization destroys the health-enhancing properties of the vinegar. Because of this, the vinegar is said to no longer contain intact enzymes and is not as easy to tolerate by the body. Organic apple cider vinegar is vinegar in its natural form. It is a rich, amber color that has a cloudy appearance referred to as the "mother of vinegar." It is claimed that this mother of vinegar is where all the vitamins, minerals and enzymes associated with apple cider vinegar are found. The pasteurization process of non-organic apple cider vinegar removes the mother of vinegar. One of the main concerns surrounding organic apple cider vinegar is that it may contain bacteria because of the lack of any pasteurization or distillation. There are some things to consider when taking apple cider vinegar, whether it is organic or not. First and foremost is the bad taste associated with vinegar. While some people can stomach drinking apple cider vinegar undiluted, others can't. Some suggestions for those who are sensitive to it are to dilute the apple cider vinegar with water or juice or to sweeten it with honey. It may also be used as a salad dressing. Also, since vinegar is acidic, enamel erosion is possible. After taking apple cider vinegar, it is recommended to immediately rinse your mouth out with water. However, avoid using a toothbrush as this could increase the risk. It is important to know that apple cider vinegar acts as a blood thinner, so those who are taking blood-thinning medication should consult their physician before beginning an apple cider vinegar regimen. The recommended dosage for apple cider vinegar varies based on the specific disease or ailment being considered and what kind of apple cider vinegar is being taken. Usually, the bottle of apple cider vinegar will specify a suggested dosage, although this varies from bottle to bottle. The most common recommended dosage is two tablespoons three times a day, generally before each meal.